About a month ago, a call for help came in for five 6-8week old heeler mix puppies that were to be put down in a Georgia shelter only because of their age. With the generous help of a local GA rescue to take the puppies in for a 2-week quarantine period and 4 wonderful RCHS foster homes to care for these cuties once they arrived, RCHS was able to rescue these sweet pups from certain death to give them a chance at a wonderful life. The hurdle of getting the pups from GA to KS was filled by the wonderful volunteers with Pilots'N'Paws. 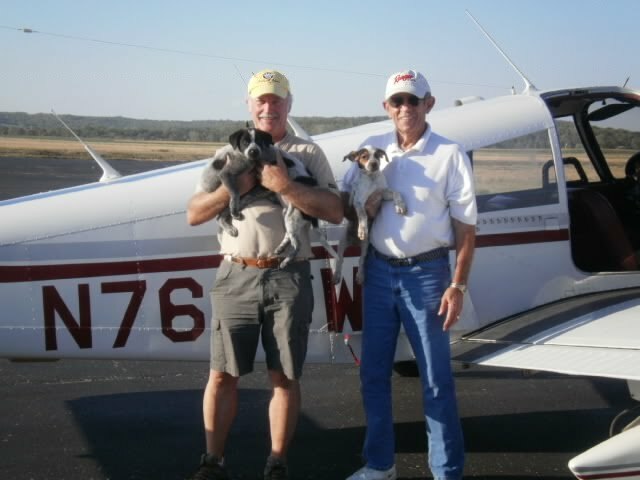 Two pilots, Jim and Sam(pictured with his helper Roger), split the flying distance and met an RCHS volunteer in Lawrence, KS to finish out the transport. Though RCHS may not be able to help the overburdened southern shelters often, we're glad to have been able to help these five precious souls get a new lease on life. This is just one example of the way rescue organizations and great volunteers work together to save lives...from all over the country.